The Buffalo Bill's amusement park is an excellent holiday attraction for children, offering everything from earth-plunging rides that defy gravity or end with a huge splash, to log rides on a fantasy lake. Kids will also love the Frog Hopper, bouncing around the park on the back of Buffalo Bill's life-like amphibian. 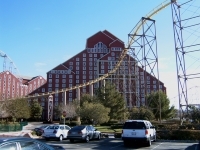 Buffalo Bill's Resort & Casino is a great choice of travel base in Las Vegas for families travelling with children as the resort caters equally to adults and kids, and is known for its high-energy live shows as well as its amusement park and gambling facilities. Youngsters will be kept happy and busy as adults explore the more grown-up attractions of the resort. Opening times: Opening times vary. Check out the availability of different attractions on the official website. Admission: Rides and attractions at Buffalo Bill's vary in price.